On a Friday afternoon, Sotheby’s international head, India and South Asia Art, Yamini Mehta, glides across the marble expanse of Bikaner House in Delhi. With 7 hours to go before Sotheby’s auction preview titled Boundless: India, the gallery walls are carefully being adorned with a constellation of artworks. One of them—a burst of cerulean blue and unruly lines—is a 1961 painting of London’s St Paul’s Cathedral by F.N. Souza, made during a transitional period in his career. The Boundless: India auction will take place in Mumbai on 29 November. It is a landmark auction for Sotheby’s—its first in India’s financial capital, which will become its 10th sale location globally. The pieces featured at the auction, as the title suggests, transcend time and geography. The works are from both pre- and post-independence period and include those that have been made in France, London and India. There are the staple Progressives: Tyeb Mehta, M.F. Husain, S.H. Raza, as well as works by Arpita Singh, Mrinalini Mukherjee and Bharti Kher. Also on sale are drawings and photographs from the private collection of Pritzker Architecture awardee, B.V. Doshi. Amid the bustle of crew members dressed in fluorescent orange jackets, Mehta tiptoes over sheets of cardboard, plastic, Styrofoam and bubble wrap. She walks towards a large, yet to be mounted painting veiled by translucent paper. 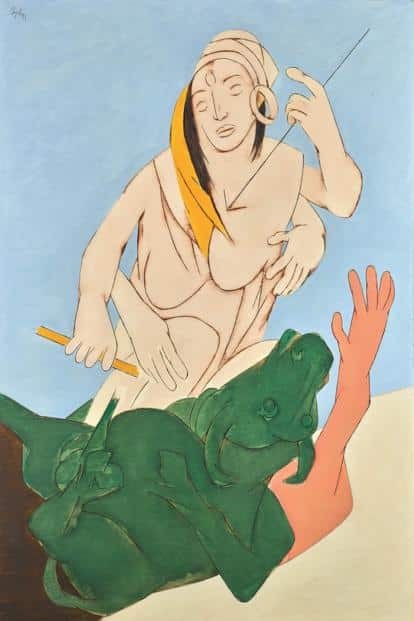 She pulls down the cover, revealing Tyeb Mehta’s Durga Mahisasura Mardini, 1993 (estimated at ₹ 20-30 crore)—a rare Mehta artwork, which depicts Durga in combat with the buffalo demon, symbolical of the battle of good over evil. It was made in response to the 1992-93 riots in Mumbai, in the wake of the Babri Masjid demolition. It is the tale behind a painting by Amrita Sher-Gil, however, that may be an exceptional crowd-puller: The Little Girl In Blue (1934) has resurfaced in the public realm after eight long decades—and the eight-year-old depicted in the painting is the artists’ cousin, Babit, who today, at age 92, still remembers what Sher-Gil was like. In 1941, a month before her 29th birthday, Sher-Gil battled the consequence of an abortion gone awry that proved to be fatal. During her brief 10-year career, Sher-Gil, who was on the precipice of inimitable stardom, had painted at least 145 documented artworks. Certain pieces became unquestionably popular: Young Girls (1932), Group Of Three Women (1935), Woman On Charpai (1940), for instance. Others ebbed into darkness, quietly remaining in the ownership of discreet family members or friends, never to meet to public eye. The Little Girl In Blue (1934), which was bought by Hungarian Indologist and art critic Charles L. Fabri, was one of them. Estimated to be sold at ₹ 8.5-12.5 crore, the painting will take the centre stage at Boundless: India, slated to be held a week before Sher-Gil’s death anniversary. For a nonagenarian, Babit or Lalit Kaur Mann (nee Sher-Gil), has a remarkably coherent memory. In an email interview, she describes the day when the artist visited her house in Amritsar in 1934 and painted her portrait. “My father, Col. Sir Buta Singh, entertained a lot (of guests) and the house was always full of visitors. Children kept away from grown-ups those days, but we had heard about Amrita, so we were quite curious as she seemed mysterious and different. I remember her always wearing a sari or a long dark skirt with a blouse. 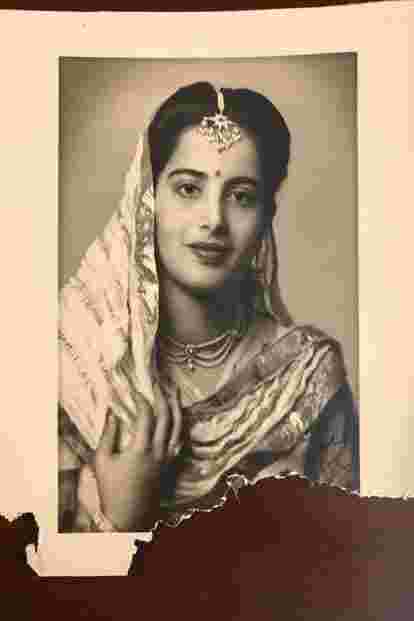 My mother, Lady Buta Singh (Mahinder Kaur), was a great friend of Amrita’s. She spent most afternoons at our Nowshera House. Her family home, Majitha House, was just across the road and she used to just walk over. One day, Amrita told my mother that she wanted to paint me. My mother agreed. Those days, children did what their elders told them to. So, when my mother told me that Amrita wanted to paint me and sit for her, there was no argument, I obeyed!" It was one of the first paintings Sher-Gil would make after she’d move back to India from Paris. In a correspondence with her parents (dated September 1934) she wrote, “I wish to return (to India) primarily in the interest of my artistic development. I now need new sources of inspiration and here you will perceive, Duci (her father), how utterly mistaken you are when you speak of our lack of interest in India, its culture, its people, its literature, all of which interest me profoundly…" (published in Amrita Sher-Gil: A Portrait In Letters & Writings, edited by Vivan Sundaram, Vol. I). In the backyard of Nowshera House, amid the orange trees and lush grape vines, Sher-Gil would go on to paint a somewhat bored and forlorn-looking Babit, directing the young girl to look away, much in contrast to many of her self-portraits, which often carried her rebellious, frontal gaze. In The Little Girl In Blue, Babit appears distant, her thick black hair tucked behind her ears, her plump, red lips seemingly full of utterance, closed shut. “I don’t remember looking forlorn," says Babit, “but perhaps it was probably because it was very difficult to sit for an hour at a time and not move. I remember (Amrita) constantly urging me to ‘Sit still!’" The silhouette of the woman in pink, which fills the left column of the frame, possibly a domestic help, came in later. “There was no one present while I was being painted," recalls Babit. “She must have added the second figure later." When the painting was complete, Sher-Gil presented it to Lady Buta Singh. “But my mother didn’t like it at all," says Babit. “My mother told (Amrita) that she could paint over it, as she wasn’t happy with it. So, we thought no more about it." Mehta reasons that Babit’s mother rejected the painting partially because she didn’t think the likeness was “pretty enough". “The mother said, ‘Oh, but this doesn’t look like Babit. I thought it is going to look more like a photograph.’ And Amrita being herself, saucily responded, ‘Well then, maybe you should’ve just got her photograph taken!’"
Unbeknownst to them, three years later, Sher-Gil exhibited The Little Girl In Blue at a solo show at Faletti Hotel, Lahore which is where it caught Fabri’s (who was rumoured to be her lover) eye. In a letter to her parents (dated November 1937), Sher-Gil wrote, “The exhibition is attracting a good deal of attention and drawing quite a large crowd….The small picture that I painted at Amritsar—Mahindro’s daughter—The Little Girl In Blue, has been sold" (published in Amrita Sher-Gil: A Portrait In Letters & Writings). In addition to this piece of historical value, Boundless: India also features personally created works by famed cartoonist R.K. Laxman. “I don’t know if R.K. Laxman’s work has been featured in an auction before," says Mehta. There are also Air India posters designed by Nargis Wadia, from the artist’s own collection. “This auction is very important to us, since it has been kind of personally curated by us," explains Mehta. “We wanted to have a mix of contemporary art, design, sculptures and photographs. So, there is something for everybody. You can get an Air India poster for ₹ 60,000 or a Tyeb Mehta which will fall into the multi-crore bracket." Boundless: India will be on view on 27-28 November in Mumbai. The auction will take place on 29 November.